The Australian Table Football Association is pleased to be able to announce the full details for the upcoming Australian Grand Prix. The tournament will take place over the weekend of February 3-5. 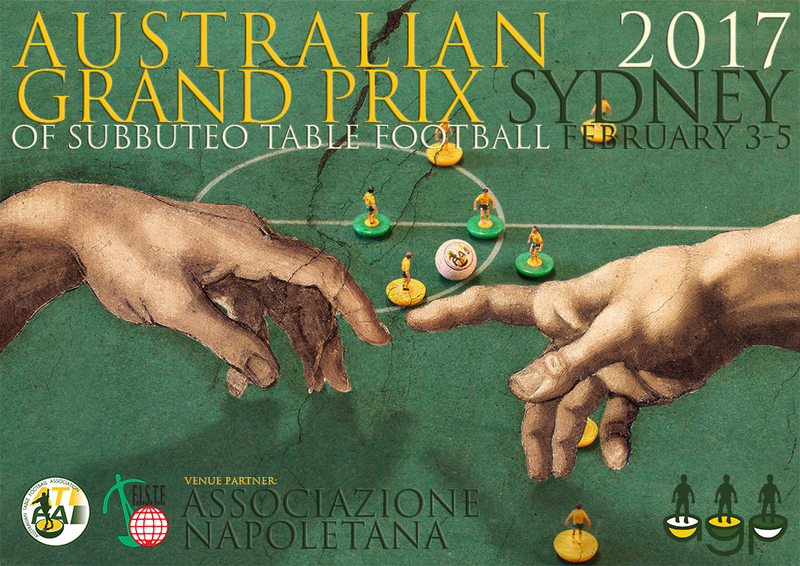 Our venue this year will be the premises of the Associazione Napoletana, found at 1A Marion St, Leichhardt, Sydney. In a packed weekend of Subbuteo, the majority of individual tournaments will take place on Saturday, February 4, including the Individual Opens tournament and Individual Junior Tournaments in U19, U15 and U12 categories (subject to numbers). The individual tournaments will consist of a group phase with the top 2 place-getters in each group progressing to the knock-out stages. For players in the Opens Individual tournament who are eliminated early, a separate WASPA tournament will then take place. Then, following on Sunday, February 5 will be the club teams tournament and, for the first time in Australian Subbuteo history, a FISTF Ladies Tournament. Another WASPA tournament will also be held for any players not participating in the Teams or Ladies tournament. The Australian Grand Prix is open to all players, regardless of age, gender, experience or ability. New players are very welcome. For any player aged above 19 (Open age), the tournament entry fee is $30. Your entry fee covers all play for both days, including venue hire and all FISTF fees. Payment can be made in cash on the day though payment in advance by bank transfer is much preferred. Online payments can be made via Melbourne Table Football Club Incorporated who will be collecting the entry fees on behalf of ATFA. Melbourne Table Football Club Inc. This year we will again be hosting a dinner on the Friday Night before the tournament. This dinner will take place at the tournament venue. The draw for the weekend’s matches will also be conducted. All players are highly encouraged to attend this dinner. Payments for the dinner will be made separate to the tournament entry fee. The price per person for the dinner will be determined closer to the event as it is dependent on exact numbers (though we are estimating $30. Attendees will also be free to organise friendly practise matches during the evening. To register for the Australian Grand Prix, please submit your full details below. This entry was posted in News, Upcoming tournaments and tagged 2017 australian grand prix, fistf, waspa on 13/01/2017 by ajebec.